Walking tours are a quick, punchy way to get to know the roots of a city. But, for a kid, most walking tours are as interesting as watching paint dry on stucco. Enter: The Runner Bean Kids & Family Walking Tour. This is one of the best Barcelona family tours that will engage your kid in Catalan culture and the Roman history of present-day Barcelona. 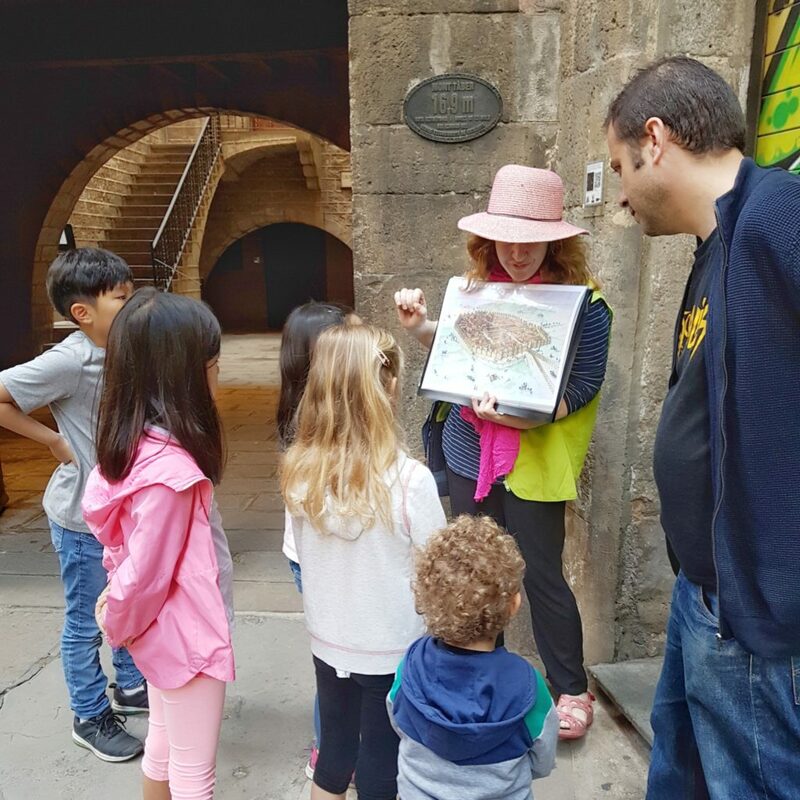 Runner Bean Kids & Family Walking Tour is a 2.5-hour walking tour for kids in Barcelona. 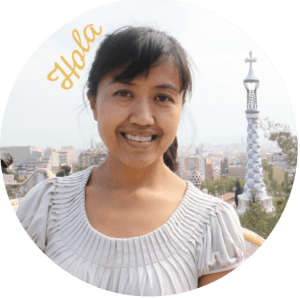 Your English-speaking guide will show you the culture, history, and hidden symbolism in the ancient and charming Gothic Quarter. Activities include fun challenges, puzzles, and games. My curious crew and I arrived at 10am at the door of Hotel Suizo, injected with coffee (adults) and cereal (kids) and ready to learn. This area gets crowded at this time because it’s a popular meeting point and it’s when all the tours start. But it was easy to spot our guide, Ann-Marie, because she was wearing a green vest. Ann-Marie was stocked with activity books. She also lent us some boards to write on, colored pencils, and a handy backpack to stuff it all in! We gathered our learning materials and sat down as she shared an informal history lesson. She also had some visuals to talk about Catalan history. First activity: the kids had a mini-race to color a drawing. YES! The kids were into it because the winner got a prize! Turns out, we were all winners. But that’s okay! 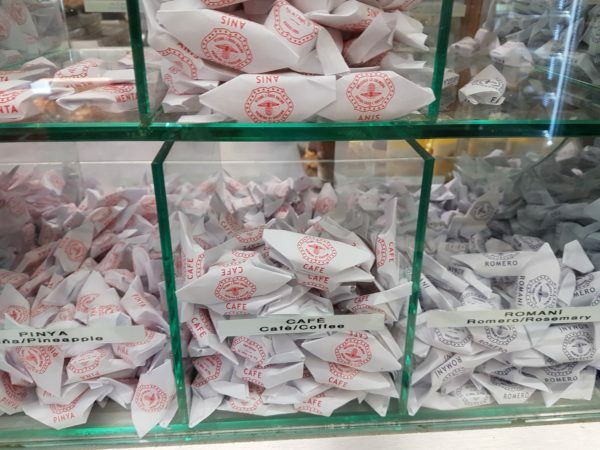 Ann-Marie took us to our first stop to claim our prize, a charming artisan candy shop. Kids picked out their flavor of sweets, as they gobbled it and got their sugar high for the next few hours. 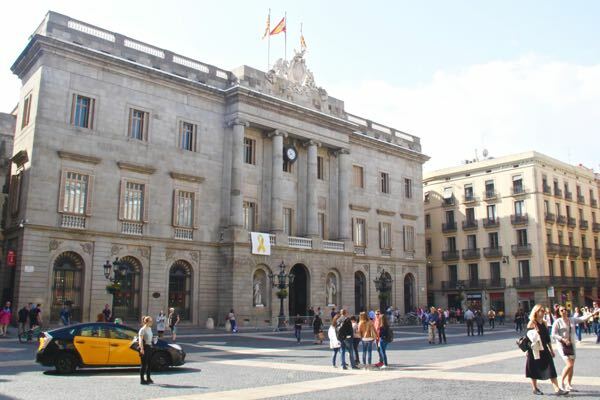 We stopped at different historical sites like the Plaça Sant Jaume, home of the Barcelona City Hall and the Government of Catalonia. We also visited the Plaça del Rei, a 14th-century medieval square. She brought out some props as she told stories of King Ferdinand and Queen Isabella. The kids were engrossed with their spiced-up history lesson. Ann-Marie used a few visuals and shared fun facts that impressed the kids. They even played a game as we trekked to our next destination. All the kids loved this, even the visitors from South Korea with their limited English! She also made several attempts to engage my shy and lethargic 5-year-old (he stayed up late the night before) – but couldn’t finagle two words out of him. She really tried! We also visited this mind-blowing piece of history right here, the Temple d’August. 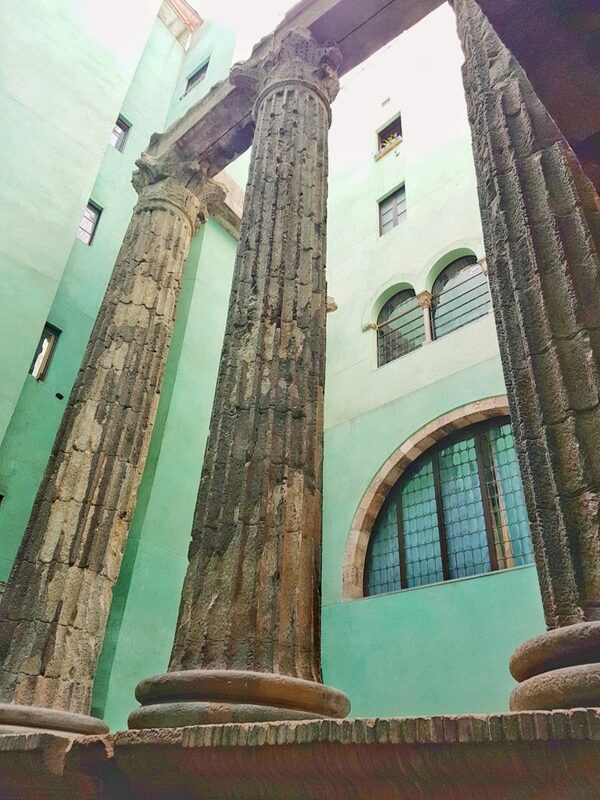 These are four Corinthian columns that made up the back corner of Temple d’August (Temple of Augustus). It was built in 1 B.C. That’s right, one year before Jesus H. Christ! Like, what?! It definitely felt like a hidden corner, so I was pleasantly surprised. We also stopped at La Casa dels Entremesos, or the Giants Museum. It wasn’t my first time here, but for my fam bam, it was. 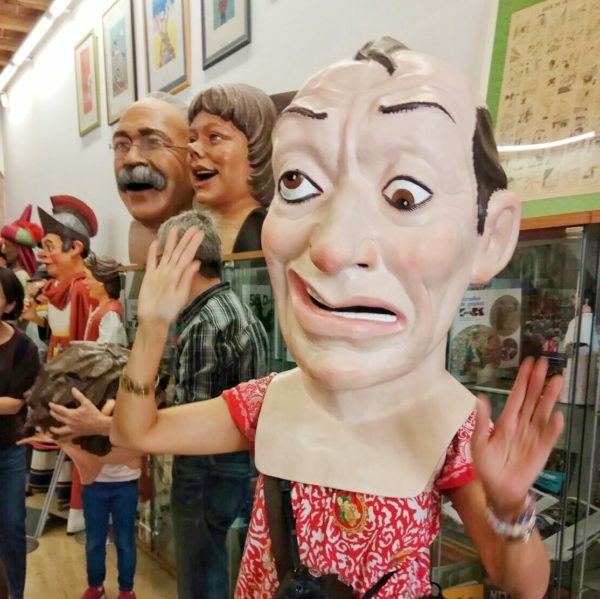 La Casa dels Entremesos is a cultural center showcasing the papier-mache gegants (giants), puppets and beasts used by Barcelona’s local cultural associations. The gegants are a cultural icon in Catalan history. The kids were bewildered by all the cartoonish characters lining the galleries. Ann-Marie explained which giants were used for which festivities. There must be over a hundred! Some kids were familiar with a few giants that they’ve seen dancing on the Catalan streets, so it was cool to see them in their “home”. The worker at La Casa dels Entremesos encouraged the kids to try on some of the papier-mache heads. They loved this!! He also let the adults give it a go. But to put it on, we had to turn our head to let it fit or else our noses would block the entry. I was afraid to try it – I had mental images of the firefighters prying it off me with the jaws of life. But I did anyway…. But my claustrophobia passed quickly, and the head came off fine. We continued our way through the narrow Gothic Quarter streets, peeking at dark corners, and sliding through old arches. Funny story: Ann-Marie even showed us a small sculpture of a Catalan figure and handed it to one of the guests to touch. Well, the guest accidentally dropped it, and the figure was completely decapitated! But Ann-Marie was so gracious – she said not to worry. It was quite funny! By the time our tour was over, the streets were already crowded and we were ready for lunch. We took our activity books home, so the kids could keep them as souvenirs. We all went home feeling a little smarter about the Gothic Quarter that day. Related: Read more about 100+ things to do in Barcelona with Kids! If you’re going in the summer, be mindful that the Gothic Quarter gets hot and crowded. Bring a hat, bottle of water, and snacks in case you hit Meltdown City. A stroller is recommended if you have some smaller ones like I do. Once you book your tour, you’ll get your confirmation via email right away. From reading other reviews, owners answer questions immediately. Schedule: Tours are in April to October only. Barcelona private tours by Runner Bean tours can be arranged ahead of time. Meeting place is at Hotel Suizo at Sant Jaume (L4) metro stop. Runner Bean can also do hotel pickups if you’re staying in the Old City. I was invited by Runner Bean Tours, and all opinions are my own. 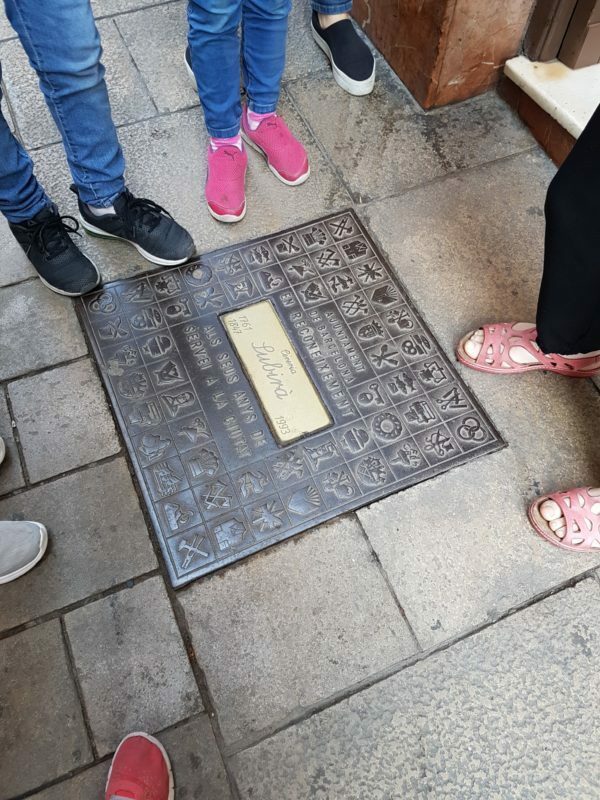 Have you been on a family walking tour before? Which one? Do you think they’re worth it?